– From a leaflet dropped by the German Luftwaffe into the 1st Battalion’s area during their retreat from Dunkirk. This page has been included as it details the movements and main events of each of the Battalions of the Suffolk Regiment. Many Brandon men joined the Suffolk Regiment, with some caught up in Dunkirk in 1940, others landing on the beaches of Normandy in 1944 and many getting caught up in the fall of Singapore in 1942. The 1st Battalion was, generally speaking, the main Battalion of the Regiment and one of the first into Europe included in the British Expeditionary Force. The Second Battalion were stationed in India and in position to counter the Japanese advances toward India. The 4th and 5th Battalions however had a more tragic time in the war. The 5th were recruited at the start of the war from the West Suffolk area. Destined for Egypt, they were diverted to Singapore in a vain attempt to keep the British colony out of Japanese hands. One must remember that these two Battalions were essentially Territorials and new recruits with no battle experience. They were caught up in the surrender of Singapore and their war was spent enduring the brutality of the Japanese and Korean prison guards, over 4 years of torture, humiliation, starvation and disease. I recognise that the Suffolk Regiment was not the sole unit to contain Brandon men, there were others, including the Royal Norfolks, and I hope that at some time to detail the other units containing Brandon men. July – Recalled to Britain from Malta; 1st Battalion Suffolks become part of the 8th Infantry Brigade of the 3rd Division. 1st October – Embarked on the S.S.”Bruges” at Southampton and landed at Cherbourg, France, to join the British Expeditionary Force, there then followed a train journey to St. Ouen, 100 miles SW of Paris. January – Relieved a sector of the French Army on the Maginot Line at Halstroff , 25 miles NE of Metz. Though they had to endure deep snow and sniper fire, they saw little action. 15th May – The 8th Brigade told to withdraw from their positions, even though the troops had been expecting to attack. 17th May – The 8th Brigade withdrew, along with the Belgian Army. 18th May – Took up positions on the River Dendre, at Leewe, Brussels and had their first real contact with the enemy as they came under direct fire from German snipers across the river bank. 19th May – Withdrew a further 300 yards to a railway line then at night to the River Schedlt. 20th May – 1st Suffolks took up position on the river bank and ordered to prevent the enemy crossing the River Schedlt and thus reaching the Channel ports. 20th May – 23rd May Held their lines at the Schedlt under fire from snipers and mortars. 23rd May The retreating British Army in Europe were placed on half-rations as the supply routes were breaking down. Petrol and ammunition was used very carefully too. 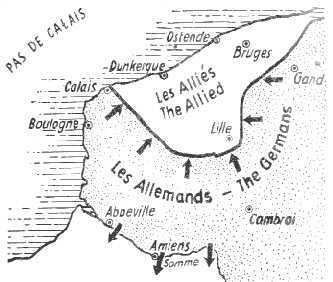 26th May – 27th May The Allies were too stretched out and as the Belgian Army withdraws from the frontline they are attacked and defeated, in the light of this and the Allies retreating, Belgium capitulates. This leaves a huge gaping hole on the British Army’s left flank, so more British troops are thrown into the gap, thus thinning their resources even more. 23rd May – 1st Suffolks ordered to withdraw to Watrelos on the French/Belgian border. The Suffolks by now were masters of the withdrawal and it came as a surprise when they were ordered to attack to hinder the German build up. All of the 8th Brigade were ordered to take part. The Suffolks, along with the Royal Berkshires, came up against heavy opposition and did not reach their objective, a railway. The Suffolks endured mortar and heavy Machine Gun fire, and their rear then came under attack from heavy Machine Guns too as a result of a lack of support. The Suffolks suffered over 70 casualties. 27th May – 1st Suffolks were given orders to withdraw back to the River Schedlt and all non -essential equipment was to be left behind. 29th May – The Royal Berkshires came under a determined attack from the Germans and subsequently withdrew, exposing a vulnerable flank of the Suffolks. They had no choice but to withdraw too. This they did under an immense barrage of German mortar and small arms fire. Some Companies of the Suffolks were ordered to counter-attack to hold up the Germans while the Allies made their withdrawal. The Germans crossed the river at the point where the Royal Berkshires vacated and all units of the Suffolks had no option but to withdraw. 30th May – Suffolks finally reach their rendezvous point, the Furnes Canal, but take heavy casualties of over 200 men, wounded, missing or killed. They are trapped in a massive traffic jam of 3 vehicles wide and 2 miles long and easy pickings for enemy aircraft. This jam is caused due to the ‘accidental’ demolition of a bridge that the Allies are using and a pontoon bridge is hurriedly erected. They are ordered to relieve another battalion overlooking the river. 31st May – Heavy shelling causes more casualties and the order to withdraw to La Panne beach , near Dunkirk, is given. The men are told to ditch anything they cannot carry. La Panne, and the road leading into it, are constantly shelled, abandoned vehicles litter the road and burning ammunition is exploding. The Division Embarkation Staff had all been killed or wounded, but the embarkation was still proceeding and thousands of men formed orderly queues into the water and await the boats to take them back to Britain. 1st June 1st Suffolks set off along the sand to Dunkirk for an alternative embarkation point. Those who get to Dunkirk board the ‘Ben Macree’ and return to Britain. En tout cas, la guerre est finie pour vous! Vos chefs vont s’enfuir par avion. Look at this map: it gives your true situation! March 1942 to Beaconsfield. At this time the ranks were depleted as soldiers were being attached to other units, such as the 4th and 5th Suffolks, who were being shipped out to Singapore. June 1943 and to Scotland. Here began practice of amphibious landings. 3rd – 4th – June Loaded onto LSIs (Landing Ship Infantry, huge ships capable of carrying a Battalion). 5th June – Sailed into the Channel. 6th June – 1st Suffolks land at Queen beach, their designated area of the British landings named SWORD, on the coast of Normandy. They are on the extreme eastern flank of the Invasion, just west of Ouistreham. At the end of the day the Battalion digs in, though they have suffered 7 killed and 25 wounded and capture 270 prisoners. 7th -10th – June Pause for re-organisation and regrouping against any enemy counter-attack. 25th – 26th June – Ordered to capture Epron. This operation is codenamed ” Mitten”, and the Suffolks are to take an enemy position, the Chateau de la Londe. 27th June – 1st Suffolks come under enemy shell fire and the South Lancs who were in support suffer heavy casualties and do not reach their objective. The 1st Suffolks stay the night in cornfields. 28th June – 1st Suffolks attack the Chateau de la Londe and by the end of the day they take possession of their objective, though at a cost of 161 men killed, wounded or missing. 29th June – For a week, constant enemy shells fall into the area of the Chateau and their are daily casualties of the Suffolks. 10th July – The Battalion hold a Memorial Service to honour their fallen comrades. 16th – 17 July – Battalion moved to Beauville. 17th July – Suffolks ordered to capture the village of Sannerville and on to Baneville as part of the major Allied operation “GOODWOOD”. 19th July – Advanced to Sannerville. 20th – 30th July – Suffolks dig in despite torrential rain and enemy shelling. 2nd August – Moved to Caumont. 5th August – Moved to Beny Bocage. 8th August – Moved to Montishanger. 10th August – Moved to a position overlooking Vire in preparation for an attack on the Falaise ‘Gap‘. 13th-16th August – Suffolks ordered to attack Tinchebray, with the East Yorkshires, with support from Churchill tanks. Enemy resistance begins to crumble. 1st -17th September – After a small period of training the Suffolks move through France, along the Seine, and are billeted at a village called Farceaux in the north of France. Battalion strength at this time is 925 men. 15th September – Moved into Belgium and dig in south-west of a village Cauville, 2½ miles from the Meuse-Escauth Canal. 18th September – Ordered to cross the canal. 20th September – Liberated the village of Hamont, with a reception of villagers offering fruit and the Battalions vehicles are decked with flowers. 21st September – Advanced onto Weert, again the reception is overwhelming. 24th September – 11th October – Suffolks are kept in reserve, though they are still busy protecting the Eindhoven-Nijmegen supply route. They then cross the river Maas and set up camp within 4 miles of the German border, though still in reserve they are still shelled by the enemy. They use this time to bring themselves up to full Battalion strength. 15th October – Attack enemy positions in the village of Overloon. 16th – 19th – October Issued orders to attack Venray. Here they lose 19 killed and 154 as wounded. 20th – 25th October – Stayed at Venray. 26th October – Spent the day in reserve at Overloon. November – Spend best part of the month in reserve, patrolling and still under enemy shelling. 24th – 30th November – Attacked a castle on the banks of the river Maas, near the village of Geijsteren. December 1944 – February 1945 – Uneventful and quiet though the Battalion is re-supplied, re-equipped and trained in anticipation of the invasion of Germany. 23rd March – The Allied assault into Germany began, with the 1st Suffolks still held in reserve. 28th March – 1st Suffolks crossed the Rhine and picked up German POW stragglers and cleared mines. 29th March – The 3rd Division, which the 1st Suffolks were a part of, were ordered to follow the Guards Armoured Division and consolidate the Guards gains. Their objective was Bremen. 31st March – Suffolks moved northwards to Lingen on the Dortmund-Ems Canal. Patrols were set up. 10th April – Moved to Bassum, 18 miles south of Bremen. 21st April – After some heavy fighting the Suffolks took the village of Brinkum, from where they could see Bremen. 24th April – The British Army assault on Bremen began. 26th April – Suffolks entered Bremen, clearing up behind the main assault and picking up POWs. 27th April – Patrolled through Strom, to Huhlenhausen, where over 100 prisoners were captured. 8th May – The 1st Suffolk Battalion’s war campaign finished in the heart of Hanover. After the German surrender the Battalion were moved to Enger to protect the Allied lines of communication, clearing and disposing of war equipment left discarded and preventing any Allied POWs released from German camps, especially the Russians, from taking revenge on the local population. 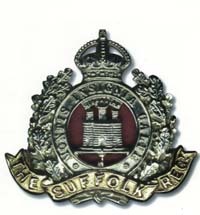 At the outbreak of World War 2 the 2nd Battalion of the Suffolk Regiment were based in Mhow, India. 25th November – Left Mhow by train. 28th November – Arrived at Mari Indus. 29th November – Continued on to Banna. 30th November – Their journey continued by trucks to Razmak. Here there were many fluctuations of temperature and it would often reach below zero. Spring – Reinforcements arrived from the ITC at Bury St Edmunds. They are quickly re-trained in mountain warfare. 14th July – Moved to Razan. 14th – 21st July – With the 11th Sikhs and the 2nd Gurkha Rifles they are called upon to ‘subdue’ local aggression to the allied force there. It would be their first taste of ‘Internal Security’ action in South-East Asia. Suffolks suffer slight casualties to snipers. October – Ordered to move to Rawal Pindi. Again ordered to quell local hostilities, this time in the Tochi Valley. Suffolks suffer a few casualties from sniping, but more men are put out of action by sickness from the intense heat. Mid-August – 50% of the Battalion are evacuated due to Malaria. 28th August – Ordered to return to Rawal Pindi. At this time many men anxious for a more active role in the British Army opted to join front line units, such as the 151st Parachute Battalion. Losing many men this way, and from illness, affected the Battalion’s efficiency throughout the rest of the war. January – Moved to Lahore. The Battalion continues it’s role of Internal Security, and it’s area to ‘police’ is about 400 square miles. October – Moved to Lucknow. April – Moved to Fyzabad. Battalion loses more men to other Regiments. The 2nd Suffolks are now placed into the 123rd Indian Infantry Brigade, of the 5th Indian Division, belonging to the XVth Indian Corps. October – Ordered to mobilise despite the lack of men and equipment. 19th October – Embarked onto the S.S. “Ethiopia” at Madras. 23rd October – Disembarked at Chittagong and began a week of marching to rejoin the 123rd Indian Infantry Brigade. November – Moved to Waybin and held in reserve, though long range patrols commenced in the hills of the Maya Range. The environment in South-East Asia would cause more casualties in the Suffolks than enemy fire. For example, for every casualty caused by battle there would be 10 men fall victim to malaria. With the war slowly turning against the Japanese it seemed they became more fanatical every day. They would overrun medical stations and kill all the wounded, doctors were lined up and shot and there were ‘suicide squads’ to defend against. These suicide squads would pick their way through the jungle at night, making animal noises to contact each other and intimidate the enemy, and when they got to an Allied position they would burst in with guns blazing and throwing grenades. 2nd January – A ‘guerilla’ platoon of Suffolks engage a Japanese outpost. They silence 5 machine gun posts before withdrawing under darkness. 24th January – Suffolks move in to take the outpost but heavy machine gun fire from previously unlocated bunkers, together with enemy mortar and grenades, stall their advance and they suffer many casualties. After 4 days the Suffolks eventually take the position and dig in, but enemy positions nearby force them to withdraw. February – Took part in operations in Burma against the Japanese Imperial Army. March – Fought at Arakan. Flown to Imphal with the rest of the 5th Division. 18th March – Flown to Imphal, Burma. 21st – 22nd March – Travelling overnight, the Suffolks were transported to defend Kohima as the Japanese Army were threatening the town. 30th March – Imphal is finally taken by the Allies. April – Suffolks ordered to return to Imphal. April 9th – In defence of Imphal the Suffolks were attacked but beat off the advancing Japanese. May – Suffolk continue their successful guerilla action against the Japanese. 2nd June – Suffolks ordered to relieve the 4/8th Gurhkas who had overrun and captured a Japanese platoon in a bunker but were unable to advance any further up a fortified hill. After 3 days of intense fighting the Suffolks defeated the enemy and took the hill. The Japanese lost an estimated 51 dead and the Suffolks suffered 14 killed and 45 wounded. July – Suffolks deployed south of Imphal to defend against a possible Japanese counter-attack, but this attack failed to materialise. The Suffolks head the chase to push the enemy out of the area. August – Suffolks are withdrawn to a rest area in Imphal. After the war ends the Battalion are returned to Lahore, though they only number 357 men. 1st September – All Territorial units were mobilised. October – The 4th Battalion of the Suffolks were split up and some of it’s members went on to re-create the 5th Battalion after it was disbanded during 1921 after serving in Gallipoli, Palestine and Egypt during World War One. These Battalions were essentially Territorial Battalions and the 5th’s new Battalion HQ would be based in Bury St. Edmunds and would recruit locally. By the end of 1939 Bury St. Edmunds and West Suffolk established a record for Territorial recruitment in England by raising 2,060 men in two months. February -Almost 200 raw draftees join the 5th. June – The first trained troops arrived numbering 250 men from the Lincolnshire Infantry Training Centre. The 4th and 5th Battalions were joined by the 4th Royal Norfolks under the umbrella of the 54th Brigade. … and their main tasks at this time of the war was the security and defence of the coast from Lowestoft, Suffolk to Mundesley, Norfolk. June – Training progressing well and involved in security of sites in East Anglia. 4th Btn training in St. Neots. & 5th Btn training in Cambridge. January – Ordered to train in Scotland 4th Btn training in Stobbs Camp & 5th training in Hawick. April – Moved to Lancashire. 4th Btn training in Whitfields, near Manchester & 5th Btn training in Knowsley Park. May – Assisted in clearing blitz debris from Liverpool streets and docks. August – Assisted Leicestershire farmers in their harvesting. 16th August – 4th Btn training in Hereford & 5th Btn training in Leominster. 29th October – Troops told they are going overseas, the assumption among the ranks is that they were going to Egypt. 4th Embarked at Liverpool onto the S.S. “Andes”. 5th Embarked at Liverpool onto the S.S. “Reina del Pacifico”. Travelled to Halifax, Nova Scotia, Canada. 8th November – Changed ships and boarded the U.S.S. “Wakefield”. This troop ship was able to carry 4,600 men and would be their home for the next two months. 17th – 19th November – Docked at Port of Spain, Trinidad. 9th December – They reach Cape Town, South Africa, and all ranks are granted shore leave. 13th December – Suffolks sail out of Cape Town with their American Destroyer escorts. Their destination is still unknown, though most still believe they will be travelling up the Suez to unload in Egypt. 27th December – Convoy reaches Bombay, India, the Suffolks then travel by train to Ahmednagar and spend 2 weeks training and acclimatising to the intense heat. At this time the 5th Battalion number 40 officers and 889 other ranks. 19th January – With the rapid advances of the Japanese Imperial Army, the Suffolks are ordered to re-embark onto the U.S.S. ‘Wakefield’ and leave Bombay. The men are now informed that their destination is Singapore. 29th January – Convoy docked at Singapore and the Suffolks are taken by trucks to a camp as the Commander in Chief of the British Army in Singapore orders a withdrawal from the mainland to the island. 31st January – 4th and 5th Battalions take up positions, although their equipment would not be completely unloaded until 8th February. All troops are ordered to “defend the beaches at all costs”. 5th February – The Suffolks come under Japanese shell fire and sustain their first casualties. 11th February – 4th Btn are relocated in an attempt to halt the Japanese, and they have to struggle through Singapore’s heavily congested roads, their only maps are inaccurate local maps and they are given conflicting orders. It is not long before they soon become lost. Eventually after 12 miles of marching they reach their destination, the Swiss Rifle Club Hill. A scout squad are sent forward and they make immediate contact with the Japanese, suffering casualties they are forced to withdraw. 12th February – 4th Btn astonishingly, they are ordered to advance! Again they suffer heavy casualties, then they are finally ordered to withdraw. 5th Btn are moved by Motor Transport through the chaotic streets of Singapore to take up positions in derelict. 14th February – 4th Btn suffer a heavy Japanese barrage of mortars and artillery followed by tanks. The Suffolks suffered badly and were forced to withdraw and they are closely followed by the enemy. 5th Btn moved forward and took over the defence of an important crossroads, with ‘A’ Company on the right, ‘C’ Company in the centre and ‘D’ Company on the left. These positions they hold well under occasional enemy fire. 5th Btn ‘B’ Company ordered to assist the 4th Battalion but they too suffer heavily and also have to withdraw. 15th February – With the Japanese still pushing forward the order was given that there would be a ceasefire at 11.30 a.m. and that a party of British officers would be passing through the Japanese lines holding a white flag. All Allied troops ordered to surrender at 4.00 p.m.
After 2½ years of training, 3½ months in transit from Britain to Singapore the Suffolks had 17 days of active service, albeit in a chaotic and confused manner, before being ordered to lay down arms and become prisoners of the Japanese Imperial Army. Though their toughest test was yet to come, being captives at the mercy of the Japanese prison guards for 3½ years. 4th Battalion strength at this time was 450 men. The Suffolks are allowed 3 weeks to rest in Changi and then are sent back to Singapore to help clean up the debris. March, April – Groups of soldiers from the 4th and 5th Battalions begin to be sent from Changi to labour camps under the pretence that these camps were better equipped to take prisoners and the accommodation is superior than what is available in Singapore. 1st – 3rd September – The remaining British P.O.W.s are given an ultimatum to sign an agreement stating that they would never try to escape. This they refused to do so the Japanese forced all P.O.W.s, numbering 15,000 into Selarang Barracks and they are surrounded by Japanese Machine Guns and not allowed any food or water. After 3 days the British P.O.W.s had still refused to sign despite the cases of disease increasing by 200%, the Japanese upped the stakes by announcing that the sick would be carried into the Barracks to suffer too. 4th September – Under duress the troops sign the ‘agreement’. late – October – Moved by train for 4 days into Thailand, their destination is Kan-Chana-Buri. 3rd November – Some troops of the Suffolks are shipped from Singapore to work on the Burma – Thailand Railway. 4th November – Arrived at Bampong. 6th November – Remaining troops moved by trucks to Kan-Chana-Buri. 7th November – To Chungkai Camp, the home for 6,000 British troops. 9th December – 50% of the men are suffering sickness, chiefly diarrohea and malaria. 20th December – The Japanese guards ordered a parade in order to select men for work on the railway. The officers refused and they were immediately surrounded by Korean guards. The guards are given ammunition and told to shoot the officers. At the last minute the officers relent and the situation is diffused. 26th – 28th January – Marched to Barnkau Camp. This camp was only half built and consisted of 5 large huts with only one containing beds. These beds were made from bamboo. 11th March – Moved to Wun-Tow-Kin. 29th – 30th March – Travelled by truck to Aruhiru. 24th – 25th April – Marched to Tarsao. 28th April – 5th May – Marched 94½ Km for 7 days to Camp 203 KILO, Martona. 16th May – The present strength of the 4th Suffolks is 255. 22nd August ¹ – The remaining P.O.W.s are marched through the jungle, for 14 days, and in intense mud, crossing ravines, waterfalls and damaged bridges to Camp 226 KILO, Konkuta. Here they are tasked with building embankments, ballasting and quarrying. Their meals are bowls of rice, which are supplemented with whatever they can forage, cats, pigs, rats, or whatever wanders into the camp. The remaining 160 survivors were ordered to march to Konkuta through the jungle. 68 men finish the march, the rest are either too ill or too weak and are picked up on barges after enduring beatings for not finishing. 6 soldiers died of their injuries from beatings. 1st – 2nd March – Travel by train to Chungkai. 10th March – The first party selected for work in Japan leaves in a convoy. Many troops are sent to Japan to repair structures and clear debris from Allied bombing. They are sent overseas on vastly overcrowded ships and there are tales of men sitting on masts, booms and just about anywhere that they can find space to sit. The prisoners endured the heat, typhoons and a lack of water, food and sanitation. The hatches were very often locked shut to prevent P.O.W.s escaping, thus preventing ventilation. These convoys of Japanese ships were also constantly targeted by the U.S. Air Force and many British P.O.W.s died as a result of drowning in these cramped sinking vessels. 7th June – A second party for work in Japan leaves.